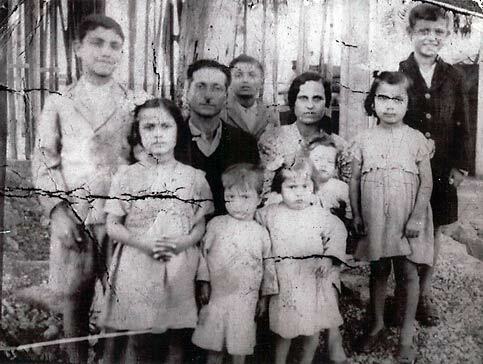 The Ayoub family in Palestine in 1948, just before Israel expelled them from their homeland. The producer went and found “another Palestinian who was willing to come on the show”. He didn’t care to know why I objected. But I care to make it clear to AJStream and to anyone who cares to know, why I find such a show appalling. Since we must perpetually put our pain in the form of analogies in order to facilitate empathy, let me do that to start off. Imagine Germany never acknowledged the Jewish holocaust. Imagine, we are living in an era where Jews are still fighting for basic recognition of their pain. Then imagine that on the day in which Jews engage in solemn remembrance of their greatest collective wound, television shows choose to feature German sons and daughters of Nazis in a discussion expressing differing views on whether or not and/or how Germany should deal with the memory of the genocide their country committed. And imagine, of course, there is a token Jew “to balance out” such an ill-timed and inappropriate public conversation. Unfortunately, what AJStream is doing is not without precedent. After the Sabra and Shatila massacres in 1982, under the watch of, and encouragement by, the Israeli army under Ariel Sharon, in which their Phalange proxy butchered over 3,000 unarmed Palestinian men, women and children, Newsweek featured an article entitled “Israel in Torment.” In other words, although Palestinians were again on the receiving end of the most savage violence to emerge from this “conflict”, Newsweek, like AJStream now, thought the most newsworthy topic pertained to so-called “dissenting Israeli voices.” They thought it was more interesting to examine ineffable Palestinian pain through Israeli eyes! One can cite endless examples of Israeli appropriation of everything Palestinian – land and home, heritage and culture, hummus and couscous, narrative and history. Now, we see an example of appropriation even of our deepest collective wound. When and how did the Nakba become the purview of Israelis? Israelis have no place inside our pain, the anguish of our society that they themselves created and perpetuate still. Why does AJ Stream think it’s appropriate, on this solemn remembrance day for Palestinians, to hold a discussion among Israelis about whether and how their country should acknowledge the savagery they perpetuated against the indigenous people of the land they now occupy? And why, most importantly, would any Palestinian lend legitimacy to such an offense? The vexing and unforgivable part of this is that some of us facilitate this kind of imperialism. Should we call it ‘emotional imperialism’? colonization of our pain? Palestinian organizations invite Israeli speakers to mark Nakba commemoration events. Why? Is there nothing sacred? Is there a shortage of Nakba survivors? Of Palestinian historians, activists, or intellectuals? Can we expect that the Nakba will now be colonized by Israeli voices? Is it simply that the Nakba commemoration only becomes real when Israelis say so, just as our history only became real when Israeli historians copied our books and published what we had said for decades? The only contribution that Israelis should make to the Nakba discourse is an unqualified, unmitigated apology, followed by a conversation about restitution, repatriation, and compensation. That’s it! Inviting a public conversation with Israelis to discuss whether their country should recognize our humanity is offensive and hurtful as we gather to remember and grieve; and Palestinians and Palestinian supporters should not stand for it. In the words of our beloved Mahmoud Darwish, “So leave…Our wheat, our salt, our wounds.” Leave our wound that you created. Just leave what so little remains. Susan Abulhawa is a Palestinian writer and founder of Playgrounds for Palestine. She is the author of best-selling novel Mornings in Jenin.